This week, each one of you has a homework assignment, you're going to go out and make a Viking fan give you the AJ Hawk salute. Okay, fine. I'm geting ahead of myself. The NFL hype machine has got us watching games that don't matter and hearing about players that can't play. There's no competition for the Packers, so we, as fans have become complacent. We're stuck complaining that Packers didn't score enough, that there were too many mistakes made even in overwhelming and convincing victory. I see so much potential for more. That's why we've formed Rant Club. 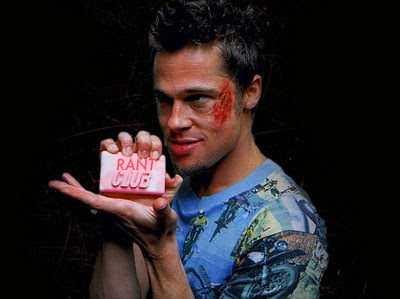 Rule number one of Rant Club: you talk about Rant Club ALL THE TIME. Rule number two of Rant Club: You. Talk. About. Rant Club. All. The. Time. Rule number three of Rant Club: Someone yells, "Go, Pack!" you respond with, "Go, Pack!" Always. Fourth rule: As many people Rant as want to Rant. Fifth rule: One man on the grill at all times. You tailgate in all weather. Sixth rule: Green and Gold gear at all times...unless it's Throwbacks. Seventh rule: Packers talk will go on as long as it has too. Eighth rule: If this is your first time at Rant Club...you bring the beer. Robert and I came to Rant Club for the first time, and our asses were wads of cheese curds. After a few weeks, we became tough, sinewy beef jerky. After Ranting, everything in your life will get the volume turned down. Are you talking about Rant Club, yet? Good. Where's my beer? I am Franklin's over-inflated sense of superiority due to being a Packer fan. Rant Club was only the beginning, now it's moved out of the basement, it's called Project Mayhem.